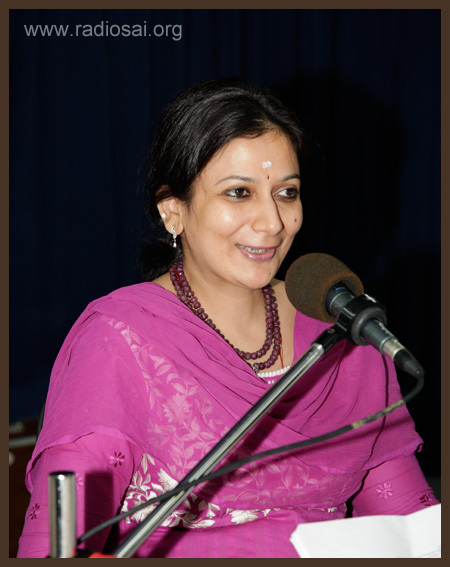 Radio Sai concluded its Navaratri celebrations for 2013 with a special discussion on 'Reclaiming the Shakti'. Drawing the participation of Angela Dickson (AD) and Shivani Sola (SS), the conversation with moderator Karuna Munshi (KM) examined how the imbalance within, without and around us could be tackled through tapping into our sensitive, selfless, nurturing, caring and compassionate nature rather than the stark frailties of the human condition. The panelists focused on how the feminine energy within could be tapped to achieve a balance between our 'yin' and the 'yang'. Angela Dickson is a Sai devotee from Scotland, UK. A mental healthcare specialist, she holds extensive experience in counselling men and women as well as children in the field of spiritual exploration and empowerment. Currently, Angela and her husband reside in Puttaparthi pursuing their spiritual goals by following the teachings of their Master - Bhagawan Sri Sathya Sai Baba. Shivani Sola is a top performing investment banker turned spiritual counsellor. She holds a Masters in Business Administration. In 2008, Shivani and her family moved back to India from the US. Her husband serves as a cardiologist at the Sri Sathya Sai Institute of Higher Medical Sciences (SSSIHMS) in Whitefield, while their son is a student of Baba's school in Puttaparthi. Their lives focus on love and selfless service as practitioners of Baba's teachings. KM: Sairam Angela Dickson and Shivani Sola. Allow me to start off with a quote from Alice Munro - the Canadian writer who has just won the 2013 Noble Prize for Literature. She says - 'There are no such things as big and little subjects. The major things - the evils that exist in the world have a direct relationship to the evil that exist around a dining table when people are doing things to each other'. As Munro suggests, the world around us is only a reflection of the world about us and within us. And right now there is a lot that is disturbing about the world around us. To give an example, we live in India and just today I found this report in a German national newspaper that said - “India has never had it so bad. Stealing in government has never been this brazen. Government officials are now so audacious in their corrupt practices that they do not give a damn about who is watching. Supreme Court directives are routinely flouted, crime rates are up and security of life including women's safety, which is the first responsibility of every government, is at its lowest ebb”. Looking at the world from this perspective, it is worth questioning whether what we see around us is but a reflection of the chaos within us. Are we projecting this internal chaos? And, what role can ‘Reclaiming Shakti’ or the feminine energy play in restoring our inner and subsequently outer balance? One starting point for restoring the Shakti principle could be to recognise the role that women play in society. And this is what Baba has to say in this context and I quote him - 'From ancient times, the feminine aspect of the Divine has been worshipped in various ways. The Vedas declare that where women are honoured and esteemed, there divinity is present with all its potency. Unfortunately, today men consider it demeaning to honour women. This is utterly wrong. It is a sign of ignorance. A typical woman is described as Adi Shakti - the primal source of all energy having a whole array of powers. She is hailed as the mother of the children of immortality or Amrutasya Putrah." This quote is taken from Bhagawan's divine discourse delivered on the occasion of Ladies Day at Prasanthi Nilayam on 19 November, 1995. Understanding gender balance is vital to recognising and identifying various energies within us including the Shakti principle. Each one of us, men, women, children, animals... carry feminine and masculine energies as does everything else on this planet. If we can learn to respect these energies within ourselves, we will not feel the need to create false images of ourselves. Given this ethos and before we proceed to recognize this intangible energy called Shakti within us and speak about how we can reclaim it, Shivani could you share your thoughts on the present condition of women. SS: The entire planet is experiencing this imbalance, which is really about the imbalance within us - the imbalance of Shiva and Shakti, of the masculine and feminine. I would not really say that this is an imbalance only in men. I would say that this is an imbalance in each one of us. We have experienced the imbalance of the collective male ego dominance for ages now. Since the time of Ramayana or Mahabharata – we have seen evidences of this attitude. But now, this shift that is taking place is pushing this male energy into balance with the feminine. Hence what we are seeing around is really the last spurts of the resistance from this male energy. But rather than pointing fingers at men, it would be more pertinent to say that it is the women themselves who need to balance it out within them. It is really a key learning for everyone on this planet. We all need to balance the Shiva and Shakti. Going back to the Mahabharata, we all know that an entire clan was destroyed because of the way a woman – Draupadi - was treated and the tears that a woman had to shed due to the disrespect and humiliation. 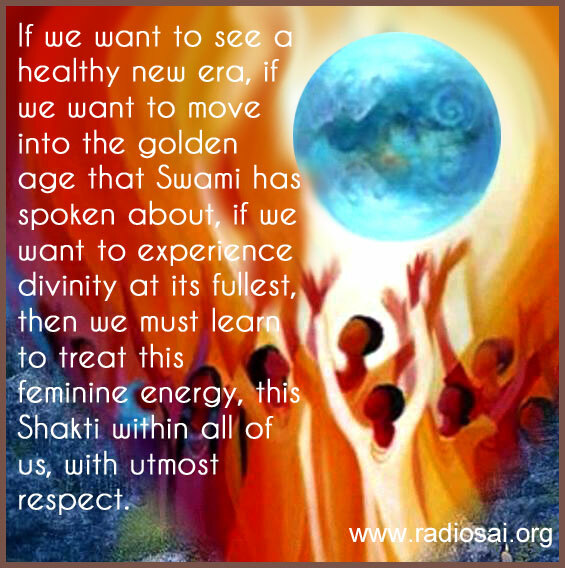 If we want to see a healthy new era, if we want to move into the golden age that Swami has spoken about, if we want to experience divinity at its fullest, then we must learn to treat this feminine energy, this Shakti within all of us, with utmost respect. And perhaps as part of this shift, it could be the men who are learning to be more human or respecting towards their creative side - the side that allows them to feel, to be sensitive, to be colourful and creative. And, the women are also tapping into the side that allows them to be strong, confident, and courageous. These are aspects of the Shakti that calls for a complete balance. AD: I also think that we as women have a responsibility to help the male species develop the principle of Shakti within them. It cannot be a scenario of men on one side and women on the other. There needs to be a synergy. Shakti is like the Divine Love, the Divine Mother and the Divine Compassion. But often I just sit and witness and think, 'Is there a sisterhood within this entire world?' I don’t think this exists in the world today. This makes it more important that we as women need to look within and address the energy and thoughts we are emanating towards each other. We want men to respect us, to revere us. But we also have to learn to respect each other, to revere each other, to think kindly and lovingly of each other also, to honour the Shakti within the self and all others. KM: Very beautifully said. I do believe that women fall short when it comes to building that sense of camaraderie among us. And, you have rightly pointed out that as mothers we have an important role to raise boys with sensitivity towards their own Shakti power to make them a lot more compassionate, caring and creative. Perhaps the media has contributed to creating this image of machoism, that we have to raise little boys into little fighters whose favourite toys are monster trucks, fighter jets and combat planes and they must play games that are very competitive and aggressive. And most certainly, the onus falls on women to ensure that the correction is made. Shivani, in your opinion, why are we in this state of imbalance? SS: This is something that has been happening for ages now, where the masculine energy has been dominant. But I think it is more important first to understand what is meant by masculine energy or feminine energy. 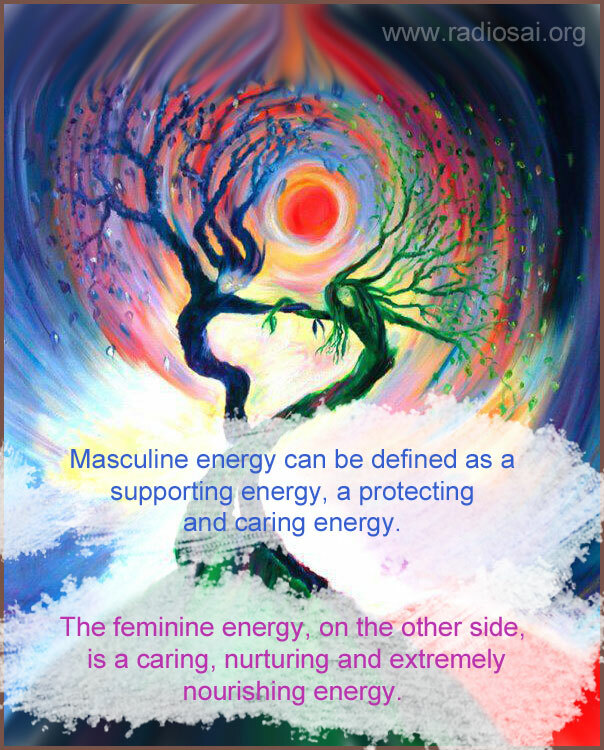 Masculine energy can be defined as a supporting energy, a protecting and caring energy. But unfortunately, when it goes to extremes it takes the form of suppression, of control and violence. The feminine energy, on the other side, is a caring, nurturing and extremely nourishing energy. But even this can be stretched to an extreme where the woman allows herself to be a doormat, allowing everyone to walk over her and treated like a punching bag. And on the other extreme, imbalance of the Shakti energy in women can see itself express as manipulative. Both extremes are not good, and it is important that we learn to achieve a balance within us. This male energy has actually gone into an extreme gear, the reason why we see so much of violence around - whether it has to do with politics, the judicial system, commerce or the corporate system. We see aggression expressed in different ways everywhere. In fact, when women get into the corporate world, many of them feel like misfits so much so that they try to adjust to the corporate world - they begin to dress like men, speak like them or eat and drink like them because that is how they feel that they will fit in. The reality remains that they don't. In the bargain, they begin to close their hearts and begin to feel more masculine. They are even convinced that any show of emotion is considered a sign of weakness. So, there is this total shut down of the feminine energy that is happening in women too. This sort of imbalance that is occurring in both men and women is being manifested in everything around us, be it the government or the political system. Swami has indeed described this as a reflection, reaction and resound phenomenon. Beautiful use of the letter 'H'. This describes an ideal situation. But why are we not there? Why are we so far from it? AD: We are far from reaching such a state because we are so far from ourselves. We don't know really who we are. We have drifted so far away that we are not able to connect to our own self, leave alone connecting with each other. I do believe that all this unhappiness and turmoil are because we are so far away from the self. SS: In my experience, all of us as Sai devotees are in search of the Ultimate Truth - the Supreme Reality. We all want to experience that. If we are not balanced, then how can we hope to achieve this Truth? Some may ask, 'why should we focus on this when we are already divine, why should we need to think about this balance at all?' The answer to this is if we are not balanced, then we cannot have that level of awareness of being Swami or of being God. So it becomes important to understand that balancing the heart and the mind, this sense of giving and receiving is a major step on our spiritual path. Only then can we experience for ourselves the complete beings that we are – as an individual who can feel and think, a beautiful blend of logic and reasoning and at the same time kind and compassionate. KM: Shivani, talking of women in the corporate who try and behave like men; can we not be industry captains and leaders while staying true to our compassionate and sensitive nature? SS: Swami has been encouraging women to take on leadership roles. And, I would say this is the time when women need to move forward. It is enough that we have been passive for so long. It is enough that we have chosen to remain in the background. Now is the time for us to take the step forward in whatever way we can. KM: But why now and why not until now? SS: Well, the golden age has just begun. From what I gather, 21 December 2012 marked the beginning of the golden age. This shift is happening and is unstoppable. At this time, as women, it is our responsibility to take those steps forward and show the way - whether in the corporate world or the home – we can balance them beautifully in a way that shows how logical, analytical we can be even while suffused with a so much love and emotion. No more do we need to shut any side of us. What better endorsement do we need than Swami’s words; I believe He had said once – ‘If you want moksha, just hold on to the pallu of your wife's sari, she will take you across’. At this point, I would like to add Swami’s words that, "Women are not to be treated lightly. The Geetha says that women are endowed with seven kinds of powers while men have only three. It is sinful to look down upon women. I guess the current state of India reflects lack of honour for women. So what do you make out of this stress on modesty? AD: From a western point of view, looking towards the Indian women, what I see is that the majority of Indian women are very modest. Their dress is very modest, they talk very sweetly and they are very involved and very caring towards their family and their spiritual devotion is very strong also. KM - And I am sure Bollywood does not represent us as a section of society because that is some fantasy group of people who live in some fantasy world where they are driving on clean roads without traffic and speed breakers and people live lives very different from our daily struggles. Nor does the Indian media reflect the quintessential Indian women. Bhagawan is the only one who has constantly gone back and tried to remind us who we are supposed to be, who we are and to encourage us to reclaim our Shakti power. Shivani, as participants in the Golden Age, how do we start? What is the first step? SS: Women must first have this ability or establish this very strong connection with Swami. Also ever since Swami has left the physical body, many of us have felt disappointed or sad or have been living in grief for some time although we have eventually realized that Swami is everywhere and His presence is as powerful. Our practices should be to strengthen this inner connection with Swami. We can ask Swami to give us or strengthen each of the qualities that you just mentioned. We can ask Him to show us the way forward, to hold our hand and to show us how to put them into practice in our daily lives. We just spoke about educating our own sons, brothers, and children of how to regard women. We could start with guiding them to show this respect to the women who work in our homes. 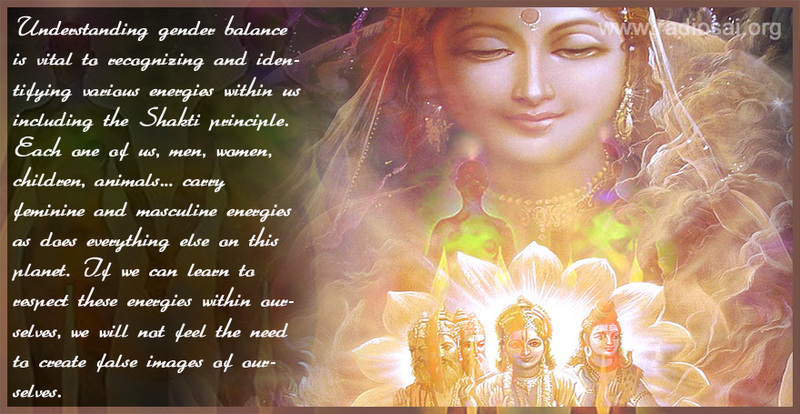 Creating this awareness about the feminine energy will then reveal itself in different facets of the society. Once we make this an ongoing process, we will see the education system bringing in a fresh perspective in students. Instead of the way it is now, about how much is scored in math, social studies or science – we will have education inculcating skills on how to give up our fears, how to tune into our higher consciousness, how to tune into Swami, and make decisions based on His will. Education should not be so much about what happened in history so many centuries ago, but about cultivating this connection and true wealth with the inner Sai. And as we begin to practice these teachings, we will gain strength from this connection that will eventually lead us to the Golden Age. I believe that the Golden Age begins when we feel that connection within each of us, when we experience the Divinity within each of us. I had a dream once when I asked Swami about what would happen in the Golden Age. He just looked up at the sky as if it is one of those things and said, ‘In the Golden Age, anything that takes root in dishonesty, cheating and lies will all go away’. So, we really don't have to worry about how these deceits will go away – it is enough to be aware that these negativities are indeed diminishing. It simply cannot last because the vibration of the New Age is such. And again the female energy revealing itself or surfacing to the top will happen whether you like it or not. It is up to the male energies to acquire knowledge about it and recognise it. And as we say, there are three ways to learn - the hard way, the harder way or the hardest way! KM: When you speak of the need to balance the two energies – it is relevant to men as well as women. It is not men versus women. Every woman who has dominant masculine energies needs to balance them and bring out the feminine side, as much as a man. Angela, any spiritual practices that come to mind that will enable us to tune in better and, as Shivani mentioned, strengthen our connection with the God within? To become more awake to the responsibilities that God has placed on us? AD: Swami came to me in a dream over a year ago and He kept on repeating the 'Gayatri Mantra'. He gestured with his hands to show me that Gayatri Mantra is to be placed into the body as well as chanted outwards. And through chanting Gayatri Mantra, which we all know is the most powerful mantra in the universe, I have been privileged to witness a great deal of transformation. Women who have suffered violence and are under severe stress, full of fear, with no self-confidence and feel weak – they can experience an immediate transformation simply by chanting the Gayatri Mantra or by placing it into their body. But to balance this again, even men who are honest and acknowledge their shortcomings, and say they are afraid of themselves because they have these aggressive tendencies and tempers – it is important to encourage them to place the Gayatri Mantra into their body. It is incredible how it transforms the negative, aggressive violent energy into positive Shakti energy. For me, this journey with Gayatri and watching the transformation has been really wonderful sight to behold. KM: How about those who say they cannot chant the Gayatri because they are not Hindu? 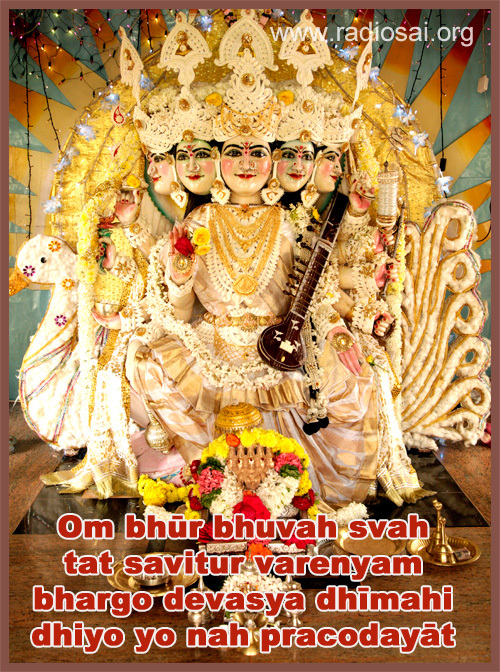 AD: Gayatri Mantra is a universal energy. It has no caste or creed. It does not matter what religion or country you are from. As Sai devotees, you are probably aware of this. With Sai organisations in every part of the world, Gayatri Mantra is being chanted in every country of the world helping the individuals to absorb this new higher energy. Chanting the Gayatri also helps us emanate the mantra from the throat - the light then radiates from within and goes out to touch many lives. KM: I understand that it is a very powerful formula and anybody can fall back on it. Now, if I chanted it as an individual, obviously it might benefit me but will it also benefit those around me, knowingly or unknowingly? AD: Yes. When we chant the Gayatri through the head chakra, there emanates a light that connects directly up to the Divine. So, we make that connection. Also by chanting Gayatri outwards the throat chakra also emanates the light and the energy of the Gayatri. Now, what happens with women whose husbands are aggressive, violent and nasty? When they start chanting the Gayatri, and even though the husband does not, the negative energy will gradually dissipate. The transformation will set in when the husband becomes quiet for no apparent reason. This transformation is purely because of the Gayatri energy being chanted outwards from the wife’s body. KM: And, will it have the same benefit if a man who has difficulty with his wife at home or the boss at work, chants it also? KM: So, regardless of who chants it, the Gayatri will have a positive impact on the individual, as well as the surroundings at home and workplace. AD: Yes. And, it is also said that the Gayatri Mantra is very, very protective. So, if we women chant Gayatri Mantra, we can be guaranteed full protection right away. KM: Like a force field of divine energy. AD: Yes, indeed. The negative energy or the violent energy just tapers off. KM: This is a good tool to have. Baba has said you don't need a particular place or a time to chant the Gayatri. You can do it anytime, whether you are traveling or driving or on the subway or walking in a dark street and feel insecure. Chanting the Gayatri definitely helps. I also understand that it develops or sharpens your intuition. SS: I have noticed that every time I do the Gayatri the way I normally practice it, I feel a sharp sense of awareness, you are so much in the present moment. I would even go farther to say that you are one step ahead of the moment. Your awareness is so acute that you are able to experience the outcome of that moment. And then the realization comes that we are Gayatri. The two are not separate. There is no Devi who is separate from you - you are Gayatri. And, it is this intense realization that the chanting brings; the reason why we must all practice it as much as we can and as many times as we can. AD: I also think it is important that we as Sai devotees pass the Gayatri Mantra on to others and give them an explanation of the power of the Gayatri and what it can do for the individual. KM: Help them ‘reclaim their Shakti’. AD: Just this morning I got a call from a wonderful Sai devotee - a gentleman and he cried over and over again on the phone. This was amazing because ever since a child, he could not bring himself to cry. His emotions were so locked up as he was brought up in a strict, disciplinarian lifestyle where it was not allowed to express emotions. But through chanting the Gayatri, his pent up emotions were unlocked and burst forth. He kept apologizing for crying and I kept encouraging him to cry. This is another imbalance in our society – that men are not allowed to cry and show emotions. Men are as loving as women but often they have been prevented and suppressed from demonstrating these emotions. The Gayatri Mantra helps men to open up and express these pent up emotions. KM: I remember Swami recommending the Gayatri Mantra to us as students to handle exam jitters. He told us that when we sit down to write exams, we tend to get all nervous and feel a knot in our stomach despite preparing well. He said to be able to recall and reproduce what we have studied, we need to have a connection to the higher consciousness, have our antenna tuned in correctly - for just chanting the Gayatri a few times before we begin will help us recall what we have studied and express it correctly. He said we would be able to download the files in our memory if we have chanted the Gayatri. 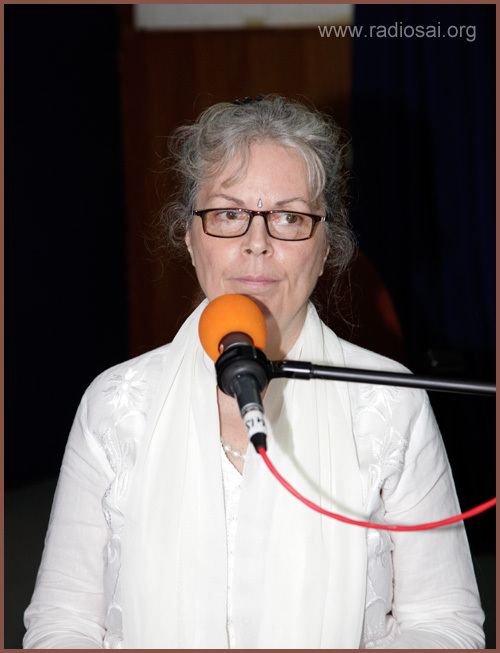 On 27 October 2013, a special discussion was recorded in our studios, on the Gayatri Mantra which was aired as Part of the Morning Glory Segment of 31 Oct 2013. You can download that segment of Thursday Live by Clicking Here. Or you can read the transcript of that enlightening discussion by downloading the transcript by Clicking Here. Now if we take this discussion a little wider, beyond men and women and our individual homes and our families, we need to reclaim the Shakti within our environment too. Right now, our oceans are receiving all kinds of effluents and pollution, there is deep earth drilling happening. Mother Earth is crying in pain because there is so much of pollution and exploitation happening everywhere. We are choking the environment around us. And Mother Earth is in pain and perhaps that is why she is throwing up these violent cataclysmic events. And, this is a phenomenon that is happening all over the world. Mother Earth needs to reclaim her Shakti. Not just as individuals, but as a collective whole and as a society, we have a responsibility to restore this Shakti balance in our governance, in our legislation, in a wider sense. KM: We must question whether it is a need or a desire? SS: Exactly, and when we start doing that, we will realize the extent of wastage we are creating around us. Whether it is in terms of clothes we have or the household items - it is a long list. So, if we start controlling ourselves, controlling these desires, then I think we are on the right track. When you look at what is happening in the environment too, the common approach is – ‘how can we acquire, how can we misuse, let us just use and abuse it’. But this is again Mother Earth, and she nurtures and nourishes us. So our attitude should really be - how is it that we can support it? How is it that we can nourish Mother Earth back? I would like to give an example of a 39-year old woman who lives in Bangalore. She was a senior manager in a multinational company and recently decided to step back from her successful corporate career. She has now started a group that is totally dedicated to serving the community. This group is called 'Whitefield Rising' with more than 1,000 members. This lady has divided the entire group into smaller units to look into areas such as composting, planting more trees, feeding the poor on birthdays and other celebrations – in other words, different forms of seva. For instance, one group meets politicians in different areas to draw their attention to the problems – about the road that is not in a good state or about too much trash getting generated by the hawkers or shopkeepers in that area. These volunteers take pictures, put it up on social media and say – hey look this is the problem we are facing, help us with this. And they are doing it in such a positive way where it is more about co-operation not operation, as Swami would say. This lady is a strong representation of what the feminine energy can do. She had the best of jobs in the corporate world and now has taken her inner strength to the community. It’s amazing the way people are joining this group, the way people are volunteering to be a part of its activities. And everyone is working in harmony and with so much love. Now, when you actually go into these areas, they look so different. And, it is all initiative of this one lady. KM: The Power of One. Each of us has the power to make such a big difference. SS: And if we were to look at what the balance of the male and female energy does - it creates harmony. We are seeing such examples being revealed every day. KM: If we could just back track, Shivani, you spoke of 'Ceiling on Desires'. Under that program, Swami said that we should keep a watch on four areas of our life - money, food, time and energy. And if each of us were to make a careful assessment before making a purchase or before deciding on doing something with our time, about whether it is really necessary or not, we would collectively create a reduction in demand because supply and demand are the foundation stones of capitalism. And if we dig deeper, desire is what creates demand. For instance, during Diwali festival or wedding season, Indian ladies' gold purchasing trends impact the price of gold in the international markets, thereby establishing a direct connection between our desires and the markets. So by being as conscientious about our spending patterns as the Ceiling on Desires program prescribes, do you think we will be a generation of self-deprived people? SS: Swami always said moderation in everything is good. But even if we were to give in to impulsive indulgences such as another set of dishes for the kitchen or a new car, we would never gain true happiness. What we experience at that moment is so fleeting and temporary, it’s all about instant gratification. Let’s also not forget that the more we get, we get greedier and there is no end to that greed. We fall into that cycle of acquiring, boredom, and acquiring again. It is almost as if there is a vacuum within us that we are trying to fill and say - if I get this one more jewellery set or this expensive sari, I will then be happy. As long as that focus is external, happiness will always elude us. But instead, if we choose to ask Swami within and say Swami would you like me to buy this – you are sure to get the right answer. 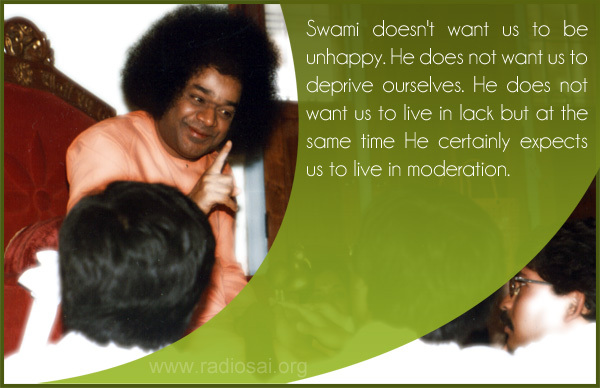 Remember, Swami doesn't want us to be unhappy. He does not want us to deprive ourselves. He does not want us to live in lack but at the same time He certainly expects us to live in moderation. To give you a personal example, every time I feel I am wasting my time or could have put the time to better use or feel I need to talk less, I ask Swami and say, ‘Swami can you show me how is it that I am wasting time? How is it that I am wasting food? Is my mind chattering?’ Either in a dream or as an experience or as an inner awareness, Swami tells me what I need to do and where I should put my focus on. This is how I remain accountable to Swami. This is how I manage to talk less without wasting too much energy. And, Swami waits to show us the way. He simply waits to guide us and tell us how we need to live beautifully, live in moderation and in contentment. AD: I agree with Shivani. To share my own personal experience – when you live in the West, you are like a hamster on a wheel as you have to constantly work to keep the house, to keep the car, to save for the holiday, there is always something. During the economic crisis, the houses went, the cars went and the jobs went. And everyone was like, ‘Oh oh!’ But what really replaced all of that is absolute freedom! All those things were like a burden that we did not realise. Swami blessed us in having freedom, in having more time to focus on Swami, to work deep within the Self, and more time to share the experience with other people and to be of service to others. This was in direct contrast to our earlier lives when it was just about work, mortgages, loans, and bills. It is indeed a huge blessing to have that weight thrown off your back. A great freedom! KM: I think we create our own vicious cycles. We create our webs, we allow others to define our choices – where to go on a holiday, what to wear, how to look. And we allow the media and the advertising industry to dictate those terms and create that perfect ideal image of the person who is successful and conforms to a certain lifestyle. Women, for example, are told it's beautiful to have a certain skin colour, hair colour, weight and size. Or, men need to have certain symbols of success and affluence to establish their level of success. It becomes so cumbersome to meet these expectations. So when you follow Swami's teachings as in your case Angela where you left all that behind and came to India to only pursue your sadhana, it must have been truly very liberating! KM: What then is holding the rest of us back? Why are we afraid to take that leap of faith and make the decision with determination? AD: I think it’s all about how the media bombards the mind with images of who we should be and what we should be. Swami again gently guides us, teaches us, shows us who we really are and enables us to become free of such parameters or myths. He shows us how to experience the Self, His beauty, His love, His direction and His teaching. KM: Going back to the concept of ‘Ceiling on Desires’ and the sense of liberation it endows – well, I attempt to practice this to some extent and find it extremely refreshing. It just takes away so much weight off my mind. Let us take this further - once we practice this and we reduce our consumption and reduce our wastages, we would make Mother Earth heave a sigh of relief because each one of us would be doing our bit to reduce our carbon footprint to some extent. KM: Swami has said we have five mothers. Apart from our biological mother, there is the cow that gives the food, Mother Earth, Veda Mata and your country. Recently, I received this thought that the amazing feminine energy within the earth is totally reflected within our bodies. So, if the Mother Earth is polluted, the mother within us is polluted as well. As women, it is said we go through the same cycles as the Earth. All life is said to arise from the oceans. When a female is pregnant, the amniotic fluid is basically of the same consistency as sea water. As above, so below. As within, so without. When we disrespect the earth by literally robbing her of her resources, we hurt all life forms. The earth is a loving mother and provides us everything we need. And if we don't show any respect or gratitude, it will strike back. Now, when nuclear waste is poured into the oceans at alarming rates as it is right now - it will result in nuclear waste making its way back into the amniotic fluid of future mothers. And that would lead to a disaster because such an alarming phenomenon will lead to all sorts of birth defects. It is indeed important as women to realise that we are the earth. There are millions of us, Swami's devotees around the world; all we need to do is make a seismic shift in our human consciousness. Why aren't we doing that already? We all love Swami. We have a commitment to His teachings. We all believe in everything Swami has told us and we are sizeable. Out of the seven billion people on the face of the earth, there are actually several millions of us who live our lives and pray in the name of Swami. Why are we not able to pray hard enough and connect with and practice what Swami has taught us, to make the difference. SS: The first reason why we are not able to put this into practice is because we feel we are not good enough. We have low self-esteem and low self-confidence. Swami says that self-confidence is the foundation to any spiritual growth. We lack that faith; we lack love for ourselves. So, when we lack that love for ourselves, how can we love anything else or how can we believe that we are capable of such magnificent changes. We need to first experience the conviction within us and only then can we manifest it outside of us. KM: What if somebody attempted that but they are in an environment where they are always put down and the ambience does not support their growth? What would you say to such men or women? SS: In my practice, I meet many such women. The answer again comes back to reaction, reflection and resound. The more we work on ourselves, the more we intensify our sadhana, and nothing negative can ever affect us. And when we do this sadhana with that focus and intensity – such as the one Angela just mentioned about the Gayatri Mantra - then the environment changes automatically. That vibration has to change. But unfortunately, we are yet to believe that it will. We are yet to believe that we are as powerful and instead prefer to regard ourselves as helpless victims. KM: I think this is an endemic problem across the board because low self-esteem is very common in youngsters in the West as well. And it reflects in very high suicide rates and poor lifestyle choices, or substance abuse. AD: Yes, it is a huge problem. But in India, as I've got to observe, you have an opportunity to go the temple each and every day. And, even if you don't go to the temple or other places of worship depending on your religion, our ears are filled with temple bells or the prayers from that distant mosque and so forth. You can even hear the chants trickling in from the home next door. So, you remain in that aura. But in other parts of the world, let’s say my own country Britain, there is a lack of spiritual strength. Ironically though, more and more of our young people are getting tired of all this materialism that surrounds us. They are feeling a sense of vacuum and increasingly looking for positive change. SS: And this is where parents have a responsibility to own. Parents actually set an example by practicing the change themselves. Let's say for example, if the parents chant the Gayatri everyday 108 times, the child will follow suit. 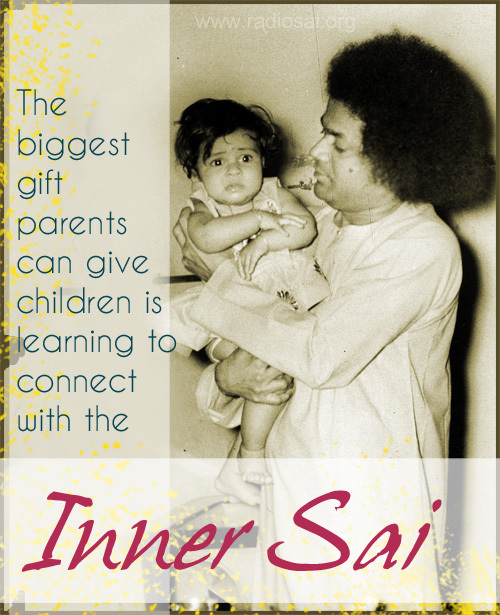 I always say that the biggest gift parents can give children is learning to connect with the inner Sai. We ask Swami – ‘What is your will? What do you want me to do?’ If your child asks for the latest smartphone or video game, you need to tell the child to ask Swami if He would like him to have that. Once this way of engagement with Swami becomes a practice or habit, children will naturally tune into that energy to the higher consciousness as a way of life. But, such an initiation needs to start early. KM: That’s the key – parents need to start early to set an example. You cannot preach what you do not practice. SS: It’s important to start early simply because you cannot suddenly expect your child to start following Swami’s teachings unless you have set an example yourself. But then, in this Golden Age, the change has already commenced. In that sense, the children that are a part of this Age are highly blessed. They are already acquiring that level of awareness. KM: And, children are so sharp and quick to absorb. We need to make sure that we don't mess it up by providing a difficult or challenging environment for them to grow up in. AD: I would like to say something here. When Swami was in the physical body, we all sat before him and spoke to Him saying - ‘Swami I need this, I am experiencing this, help me with this one’. But now, Swami is telling us to be Swami, the Shakti and Shiva manifestation. Swami says – ‘find Me within yourself’. I think it is important to recognise this – in this present moment. KM: For each one of us to realize that I am Shakti and I am Shiva? AD: Yes, primarily because Swami has told us often who we are. And, as Shivani said, we do not believe in our own self, we do not acknowledge the true self despite Swami’s repeated reminders. But now, this is the time to find the Swami within, the Shakti within and then live it, express it. Be the example of it and, in doing so, help others to find themselves and find their God-self and live in that knowledge. KM: Live your Shakti self and manifest all those qualities! How much inner work do most of us need to do in order to get there! SS: The time is perfect. There couldn't have been a better time as the golden age is just unfolding. If we had done this say 15 years ago, the impact would not have been as effective. But now, if you practice this consciousness even a little bit, the impact is bound to be a hundred times more. KM: Because the vibration or the spiritual environment of the Universe is more conducive? SS: Absolutely. It is as if a large window or a huge opportunity is opening up for every soul on this planet. It is for us to either take this opportunity or let it pass by. KM: I say grab it with both hands. We would have gone through many, many lifetimes to have been born as contemporaries of the Avatar, to be aware of His glory, to know of His teachings. And, if He has said that we are Shakti, we are Shiva - we better believe it. AD: For our benefit and the benefit of all. KM: And, for the benefit of our planet - Mother Earth. Your final thoughts on Reclaiming our Shakti? SS: Women should know that they have the right to make choices. Most women believe that they are helpless victims and their whole energy is getting completely eroded and they don't have any rights. Well, we all do. We are all divine beings and we have as much right as anybody to make the choice - choices as guided by Swami. KM: And I think we will be more powerful in expressing our choices if we do it with restraint and self-confidence. I say this because we are emotional beings and we tend to go over the top sometimes. Swami always advocates that restraint and modesty strengthen us. Unfortunately, both these attributes are considered as weakness when they are actually strengths. AD: To reclaim the Shakti it is very important to love ourselves and then in loving ourselves to love others; to truly create a sisterhood and brotherhood of mankind. Sairam!